We've known Orbita CEO Chuck Agnoff almost since the founding of his company, and we've seen many innovative products over the years. But with this winder, the first suitable for travel, he has outdone himself. 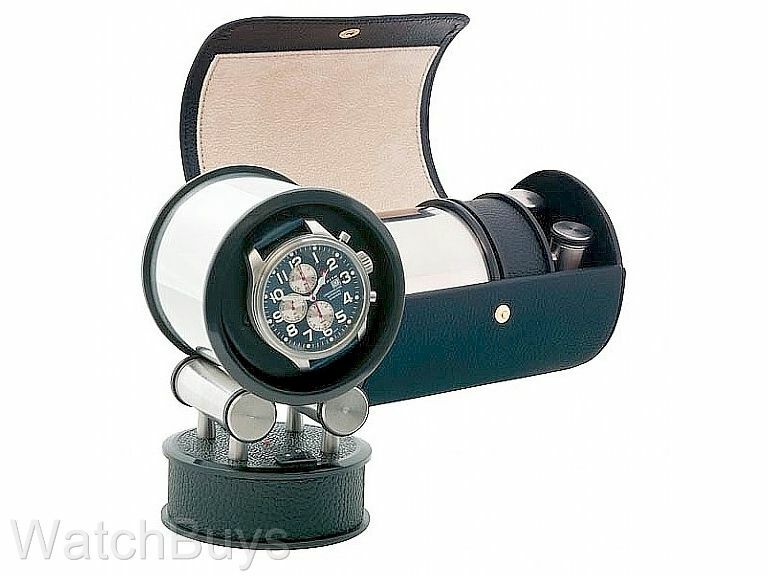 Using a unique lined stainless steel cylinder which serves both as a watch holder and a rotating cylinder, this watch mounting system provides protection from rough handling as you travel. 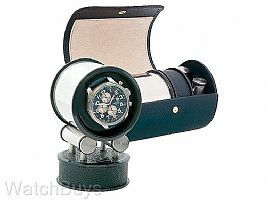 Orbita’s travel watchwinder, the Voyager, is a programmable travel winder with three components. First, a drive unit employing a Swiss designed micromotor which is concealed within one of the stainless steel support rollers. They are mounted on the round black pedestal base which is also the battery holder. Second, a rotating lined stainless steel hollow cylinder, into which the watch is mounted, which is placed on the idler and drive support rollers which are fitted with soft runner tires. Third. an elegant suede lined black leather carrying case. Watch rotation is determined by the placement of the mounting cup on the base. If clockwise rotation is required, the cylindrical mount is placed in one position. If counter-clockwise rotation is required, the position is reversed by 180º. As is true of all Orbita winders, this travel winder is programmable offering winding cycles of 800 or 1300 turns per day. A blinking LED light signals when batteries need to be replaced. The 4 batteries employed are readily available AAA alkaline cells and a compact AC/DC adapter is also provided for wall plug-in use worldwide. The Voyager control microprocessor automatically detects low battery voltage and adjusts the winding cycle so that the correct turns per day (TPD) program is maintained. The two components are safely and securely placed in an easy-to-carry cylindrical textured black leather carrying case with snap enclosure. The case is lined in protective suede to prevent scratching and to absorb vibration.